I really like Vaytsekhovskaya’s reviews and I thought it may be interesting for you too. Here’s a translations of her review on Rostelecom cup 2016. Commenting the competition of dancers on Saturday Tatiana Tarasova dropped the phrase: “Don’t forget that we are not guests here.” The comment was interpreted clearly: don’t wonder too high scores for Russians. In the end, no one has ever canceled the “home judging”. The result in ice dance turned out in the most favorable way for Russia, but not due to this reason. Of course it’ll be hard for Bobrova and Soloviev to expect such high scores at other tournaments, but Saturday’s victory did not cause any questions. It was won by the Russian dancers without a fight: Evan Bates made a big mistake in the free dance, they lost on twizzles more than four points and lost to Canadians Kaitlyn Weaver / Andrew Poje, but kept the overall second place only because of the gap after the short dance. Canadians were treated ruthless in Moscow. Their coach Nikolai Morozov, to whom Weaver / Poje moved a year ago from Anjelika Krylova, made a memorable programs with a variety of original elements, but alas: in the first performance of Canadians their levels was “cutted” so much, that they were only fifth in tech, and the gap between them and Bobrova / Soloviev, Chock / Bates was so significant that it was possible not to worry about the fate of gold and silver. Just on Friday, there were no signs that the Americans will screw up twizzles and the Russian pair will receive the coveted 15 points for winning the gp and will already guaranteed a place in the Grand-prix Final. It’s yet too early to talk how competitive Ekaterina and Dmitri can be at major competitions, but it appears that in the final they will be the only duo from our country. Elena Ilinykh / Ruslan Zhiganshin took the fifth place at their first grand prix, which gives them seven points, the same position received in Canada Alexandra Stepanova / Ivan Bukin. As for Victoria Sinitsina / Nikita Katsalapov, who will compete in China and Japan, the entry list of competitors there is such, that they can expect to receive a passing score only hypothetically. Actually the most frustrating leitmotif of this season in ice dance is the fact that the Russian results (whatever duet we’re speaking of) depends in most cases not on their own skating but on their rivals’. Moscow stage wasn’t an exception: Bobrova and Soloviev coped with their performance as good as they could, their coach Alexander Zhulin noted that he was very pleased and doubly pleased that the pair managed to perform so well on the home ice, but at the same time we have to admit that apart everything else the winners were very lucky. – You don’t want to estimate the skating of this pair, you just want it to watch it. By the way, from a professional point of view everything is very clean: sufficient speed, interesting skating, good lines. Plus an amazing cheerfulness. Canadians are happy on the ice – although, believe me, no one is delighted skating the free program. Changes that happened in rules since then (and in many ways provoked by this incident) have led to the fact that now all leaders without exceptions, in pair and single skating started to show complex and fast skating. But here’s the paradox: even with a successful skating an overwhelming majority of Russian athletes always leaves an impression of people who’re working so hard. Perhaps, that’s why the appearance of Mikhail Kolyada in the team was taken with such enthusiasm. But now the charm is faded a lot – also because of the fact that both programs have turned out pretty in the same style. It happened to some extent due to the fault of the leaders of figure skating federation, for whom the new short program that skater showed at the test skates in Sochi “did not seem” and they insisted that Kolyada get back to last year’s program. And two program in the same style, always leave a feeling of already skated, already seen and therefore secondary. Plus the lack of complexity: skater, who finished last season with a best result among Russians, has only one quad yet. The duel between the young Japanese talent Shoma Uno and two-time world champion Javier Fernandez finished in the men’s figure skating by indisputable advantage of the Spaniard: lost in the short program (with a combination quadruple and triple toe loop and triple salchow instead of quadruple) about seven points to Uno (flip, toe loop and a triple axel in the second half of the program), the Spaniard beat his opponent in the free program on almost fifteen points, and did it effortlessly. If you wonder what is the key that can open the cherished door to the pedestal, the answer is obvious: such skating as Fernandez demonstrated in Moscow. 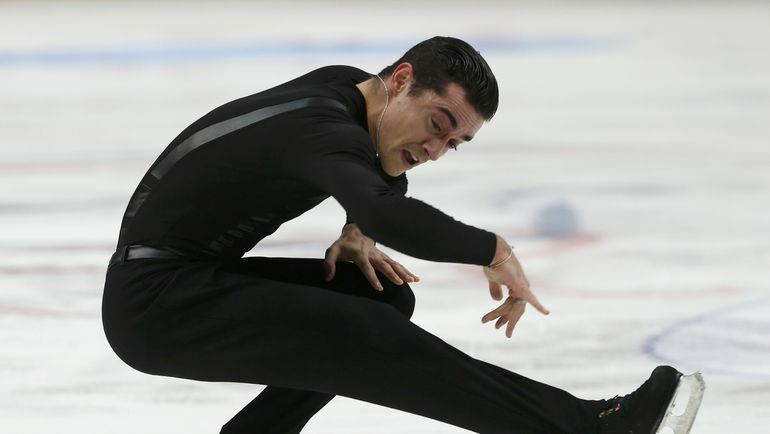 He, like Uno, executed in the free program a variant with three quads, but if the Japanese struggled with his third jump and eventually failed it, Fernandez’s skating was so relaxed and ironic that all jumps went by the wayside: they didn’t look like feat or end in itself. Waiting for the tournament of pairs, where the five-time world champion Aliona Savchenko had to take revenge for the debacle in the short program, I recalled the famous Russian coach and Olympic champion Oleg Vasiliev on his own words spoken about Savchenko before the Games in Vancouver, when Vasiliev coached Maria Mukhortova / Maxim Trankov, and she skated with Robin Szolkowy. Then the coach said that he quite clearly see the German “ceiling” – the level above which the athletes likely won’t be able to jump. In Moscow Vasiliev admitted that Savchenko, destroys all his notions of human capabilities and doesn’t stop to amaze with her constant desire to to be first. Of course, everyone waited a sensations from the German-French duo. At practice skaters have amazed the public by the amplitude of their throws, twists and quality of jumps. But on the first day of competition Savchenko / Massot made a lot of mistakes: first synchronous fall on jump and then Aliona landed the triple axel throw on two feet. But even with so many serious marriage duo scored second, loosing less than a point to Nina Mozer’s pair Natalia Zabijako / Alexander Enbert. Sensation, for a fairly narrow circle of professionals, people eventually received: on the last seconds of performance Savchenko performed a quadruple throw. Given that all the turns were rotated Aliona fall on the landing. But the fact that athletes dare to put an ultra-c element at the end of the program, despite the fact that the first throw was unsuccessful, spoke about the ambitions and their readiness to implement them. Perhaps, no one pair in the world shows such an attitude to the pair-skating and striving to extract from it the absolute maximum. Savchenko already has such a risky episode in her biography: at the Olympic Games in Sochi, just in the last seconds of the free program Aliona and her former partner went on a rather desperate move, tried to fulfill the triple axel throw: the one that didn’t turn out with Szolkowy, but stable enough in training with Massot. Upon successful execution the Germans then could claim even for victory, but didn’t cope with the element. As a result, in the free program Savchenko and Szolkowy were fourth and won the bronze medal in the overall standings. But in Moscow Aliona and her partner almost didn’t risk anything. Where else to try a new element in a competitive environment if not on the tournament with the maximum weak competition? – It’s a shame, of course, that we both fell on salchow in the short program – such hasn’t happened with us yet. And throw … I can not say it was difficult. The fact is Bruno throws me to such a height that to rotate four turns is easier for me than three. We have enough strength, in this regard, we have prepared the free program well. With the beginning of “Grand Prix” we were organizing a competitions for ourselves in Oberstdorf every week, performing absolutely in the same mode as the ones who skated in the US and Canada. So, we can say that the current stage is a third for us. I also can explain why we decided to put the quad throw as the last element: after the quad throw it’s difficult to jump. Well, where else we had to put it, if not at the very end? The tournament, which is by all indicators was supposed to be victorious for Russians became dramatic: Julia Lipnitskaya, started greatly her program, suddenly popped the jump and actually stopped to skate. Hardly skated to the referees and then to the coach. Then again to the referees and then to the coach. And as hardly skated to the center of the rink – to finish her program in front of the weeping of despair fans. Before the competition Julia struggled with injury she got in early autumn at the tournament in Bratislava. Because of this, she had to make the jumping content in the short program easier. She planned to start to complicate it again, but at the wrong time injury got worsened. According to Alexei Urmanov stop in the middle of performance occurred due to the fact that Julia stopped feeling her leg. Perhaps, the most rational solution would be not to continue the program, but here affected an inflexible character: on the obligatory question which in such situation referee is obliged to ask: whether an athlete wants to try to finish the performance – Lipnitskaya answered affirmatively. It’s clear that it wouldn’t bring her large bonuses to the result, but the skater anyway did the best she could. Force Majeure unwittingly affected Elena Radionova: she was already set to go on the ice, but instead had to wait until the judge and Julia with her coach will take a decision. Her coach Inna Goncharenko philosophically remarked on this occasion that they also must be able to pass through such situations. In general, the second place was a success: from the first day of the tournament, it was obvious that to compete with Anna Pogorilaya, who is in excellent shape, it’s almost impossible. And the free skating only prooved it. Like a lot of people, I think Yulia shouldn’t have continued to skate. But despite her injury, I’m happy to see that his level is coming back. Hope she will soon get back in good health and I wish her all the best for Russian Nats ! Javi and Shoma… they are so talented! Their skates were very memorable like almost everytime. I can’t wait to see them live in Marseille!!! Wow, I’m really envy) You will see all this great skater live! I’d love to hear your live impressions! Weaver and Poje were so severely underscored in the short dance. I LOVED it. The Shoma and Javi battle was so much fun! I love when two great skaters get assigned to the same event! Aliona doing the quad at the very end of the program honestly scares me. I think it’s a bad idea to be honest – I don’t think they can consistently land it there. If she’s so scared of the quad, then they should take it out and stick to their trusty 3A. Julia…I really don’t know what to say. Elena and Anna were both really good. I like them both. But I’m afraid Elena will get squeezed off the team when Maria Sotskova makes her debut. Elena still looks a bit juniorish and now has to fight for her jumps. Anna looked very impressive! I think Anna has the makings of another great skater, now that she’s winning her events after puberty instead of before it. I have a lot of faith in her. Yeah, now I now for sure when judges gives Javi and Patrick almost the same marks for skating skills and transitions it’s just ridiculous. Javier is way overscored. Patrick, Shoma, Stephane Lambiel, Jason Brown, now those are people who deserve big skating skill marks. In my opinion specialists in figure skating did not expect any triumph from Russian figure skaters in this COR, except from ladies. It is clear that Bobrova/Soloviev’s style and their dance is not a masterpiece, however they are skating on very high level. In case with Julia, it was heartbreaking, why did her coach let her scate till the end?What’s the favour?